At this early stage list building opportunities would be quite limited without the addition of the Beasts (which we will cover in a blog article or two next week) and the Wayfarers, which we will look at right now! The Wayfarers are guns for hire and as such, can be hired as a team, or individually. As a team you will, of course, be using them as a single crew, with Wishbone as their leader, and using the leader part of his profile. However, should you choose, you may also take individual members of the Wayfarers as mercenaries, for use with any faction. You can even hire Wishbone, who will have a slightly different profile, and be cheaper. So, over the next couple of blog articles we will be looking in more depth at the Wayfarers individually, and discussing their tactical uses. 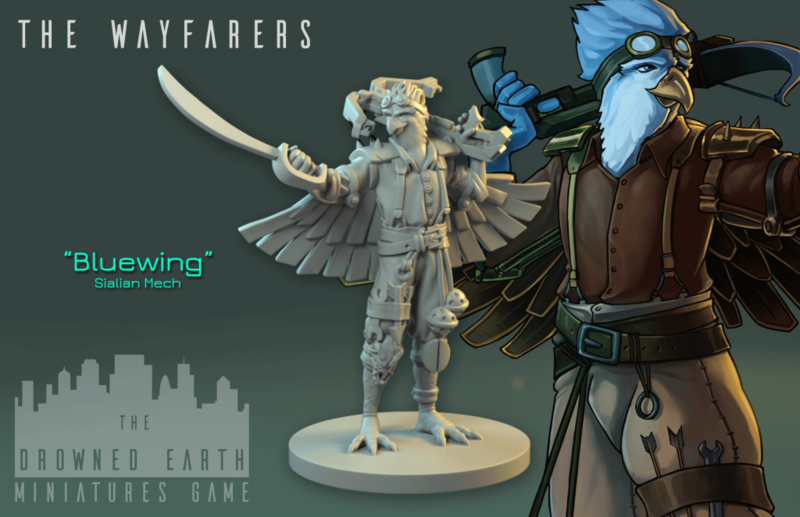 As a slight caveat I should point out that the Wayfarers are in the middle of play testing right now, and so some details might be subject to change. Broadly speaking though, we will preserve the general character of each of these miniatures. 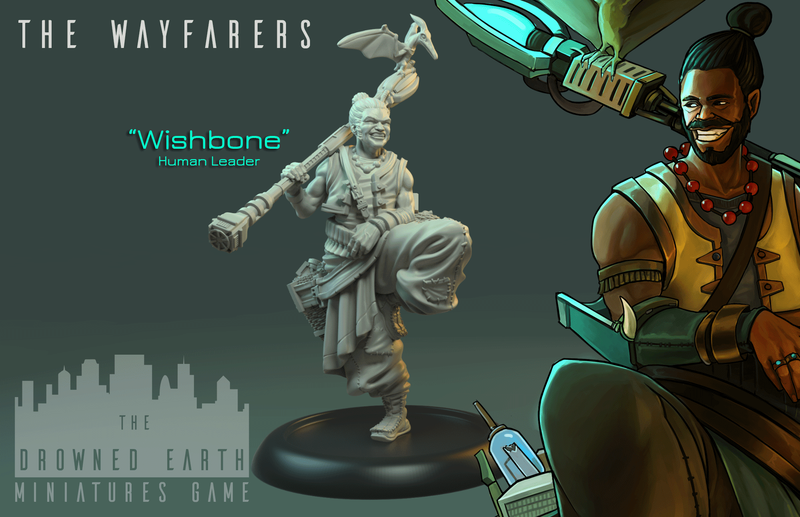 Lets start at the beginning, with Wishbone, the leader of the Wayfarers. When you take the Wayfarers as a crew Wishbone will be your leader, and just like other leaders, will have the Command ability, and 3 Action points. However, should you take him as a mercenary for another crew he will just be a regular member of the crew. This means he will not have his Leader Class Role; He will not be able to use the Command ability (which allows a Leader to move Action Points between models in their crew, provided they have line of sight and pass a Command Test) and will have the usual 2 Action Points. Of course he will also be cheaper than his Leader profile version! So what does Wishbone bring to the table? Firstly, while he is only of average speed he is quite agile, meaning he is excellent at positioning himself. This is particularly useful for a leader, who’s Command ability relies on Line of Sight. But it is doubly useful when one takes in to account his weapon! Armed with an Energy Staff which fires a bolt of explosive energy, and uses a small template weapon. One of the best things about this weapon is the relatively long “Pass” range, meaning that in firefights he often only needs to pass versus an enemy who will have to Nail It to hit at all. Wishbone also has the “Run and Gun” skill, meaning that he can dodge out of danger if he successfully lands a shot. This is very useful if he over-extends himself to take a critical shot with his last Action Point. This would leave most models vulnerable to retaliatory fire, but Wishbone can use this dodge to pull back to cover, or even drop prone! In Close Combat Wishbone can hold his own, but does not excel. However, his helpful Dactyl friend Bobo gives Wishbone the “Counterstrike” skill, meaning that any damage he saves in Close Combat is reflected back on the attacker! Wishbone is fast and agile, making him a good fit with a classic Artifacters crew, where Run and Gun and high agility are also a core tactic. However, his reasonably reliable, mid-range firepower can help the Bondsmen keep their enemy in check, as many Bondsmen characters lack good long range weaponry. In general a damage causing round template weapon is quite rare, and useful against lists who have spent points on weak but numerous dinosaurs! Bluewing is also slightly above average speed, and very agile, especially when leaping down- his metal wings aiding him! So not only does he make an excellent model in reaction, his mobility means he can often be an important objective grabber, or swap one cover point for another. Of course his ability to repair jammed weapons is complimented beautifully by this extra mobility, when an important model blunders and finds themselves unable to shoot! Bluewing seems a good fit for the Militia, who have no other availability to the Overwatch skill, and very few fast and agile models. As a crew who rely on keeping their enemy at range Bluewing is a good problem solver, both to grab objectives and fire on an advancing enemy. However, all factions would benefit from Overwatch- even those that have it already! I hope you’ve enjoyed this quick foray in to the Wayfarers tactical uses. Of course there is much much more than I could write in this short article, and much more yet to be discovered when delivery happens, and everyone starts playing! Exciting times ahead! Tomorrow we will look at the remaining three Wayfarers, including Grayze- the one model which nobody has seen yet!